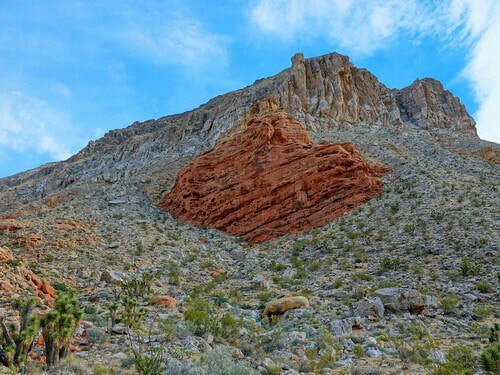 Cross the Beaver Dam Mountains, visit a huge sinkhole, drive a narrow tortuous canyon and see "3 Corners" where Arizona, Nevada and Utah meet. 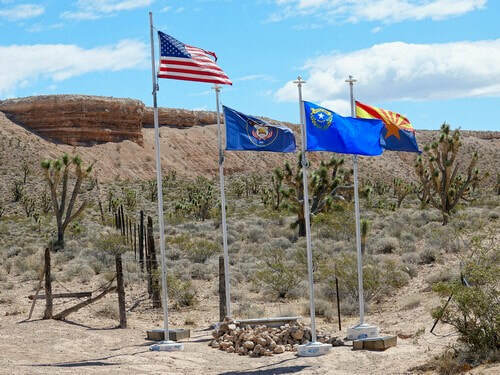 The original 3 Corners Monument (a sandstone shaft) was established in 1870 on what the surveyor believed to be the 37th parallel, north latitude. 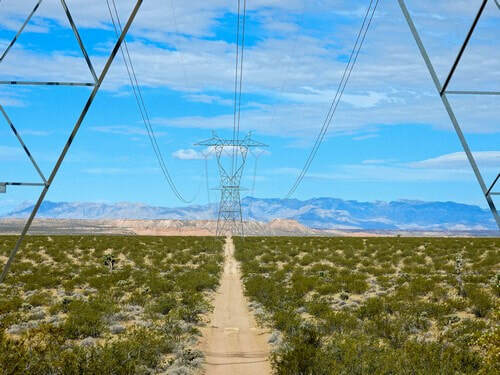 A 1901 resurvey determined that the original shaft was 111.51 chains (1.4 miles) too far north, so the old shaft was destroyed and a red sandstone shaft was placed at the correct location. In 2017 the Utah Council of Land Surveyors, in cooperation with the BLM, replaced the 1901 shaft with the Monument seen there today. The 1901 red sandstone shaft is on display at the Washington County Administrative Office in Saint George. 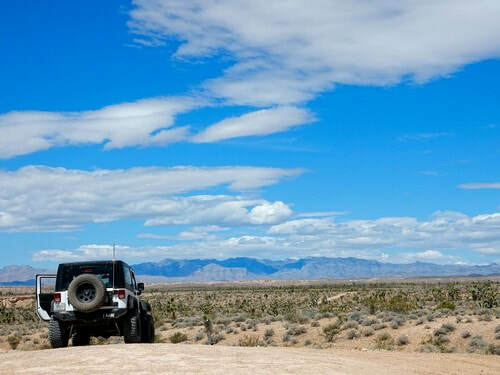 An easy trip that will take 5 1/2 to 6 hours round trip from Saint George. 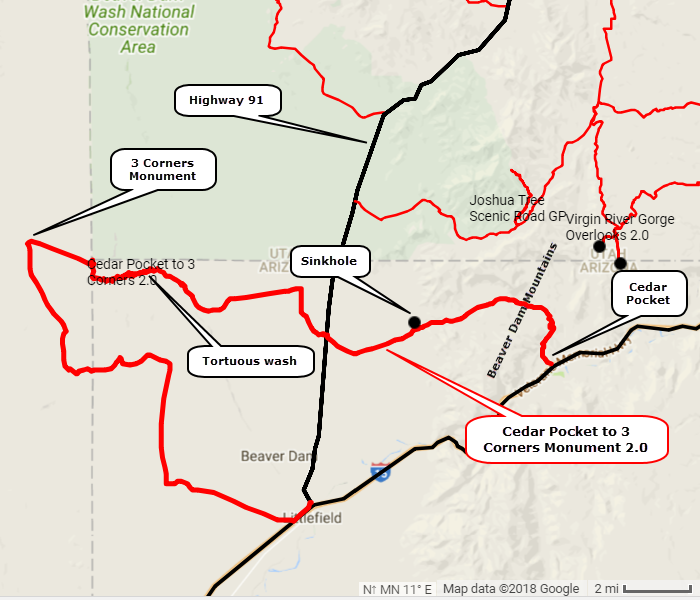 Begin off I-15 at the Cedar Pocket exit and head into the Beaver Dam Mountains. 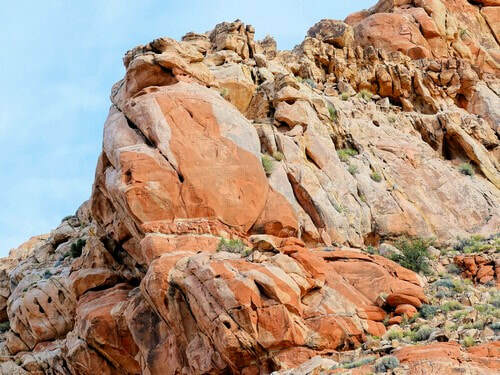 We enjoyed the colorful geology. 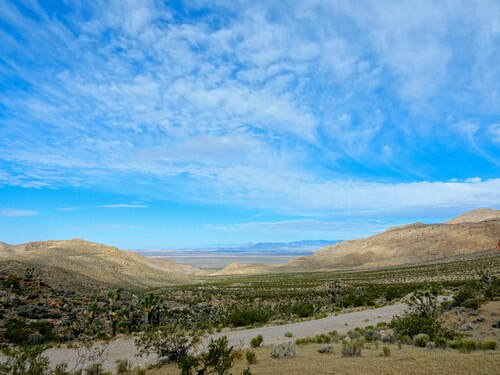 Cross a height of land and see the wide expanse of flat country along Beaver Dam Wash in the distance. This will be part of your journey. 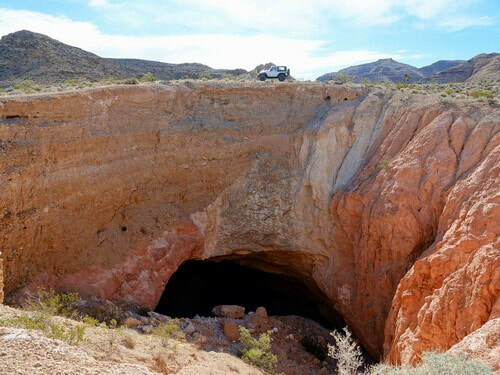 ​Take a short spur to a huge sinkhole, then continue to Highway 91. 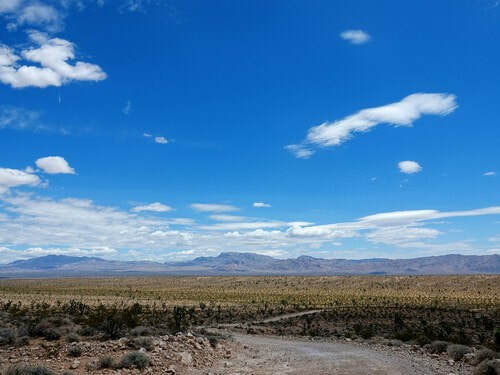 Cross highway 91 and traverse flat, open desert on your way to more interesting country. 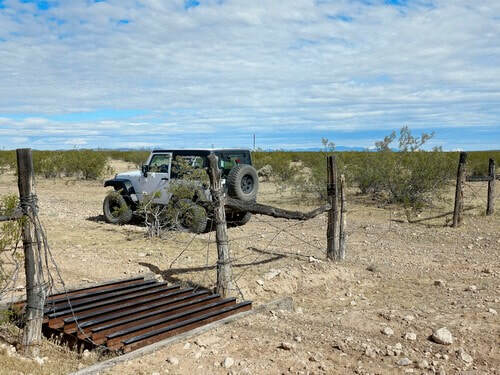 ​This unusual cattle guard is wide enough for an ATV, but not for a regular vehicle. First one of these we have seen. 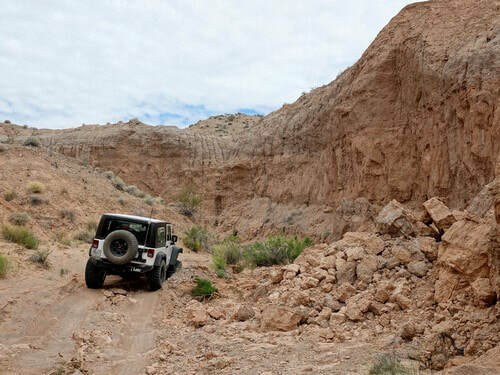 Drop down into Beaver Dam Wash, follow it up for a short distance then turn left into a minor wash. This is a narrow, winding canyon that is a lot of fun to drive. 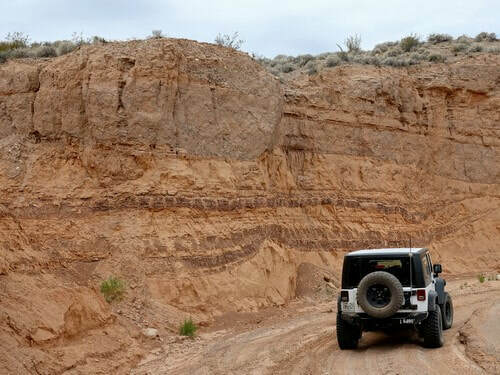 The walls are continually collapsing, so be prepared to pioneer a road around the debris if you are the first one there. 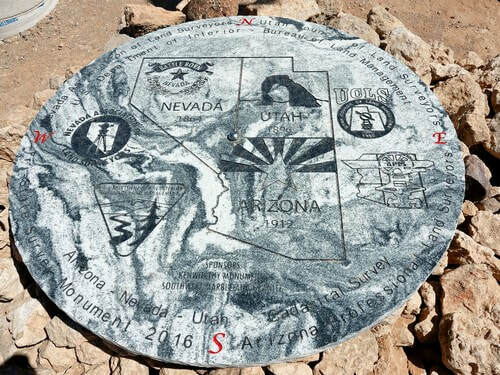 This is the Monument making the actual location of the state line intersection. The road from here out is all rated GP, so could be used by a lesser vehicle to visit the Monument. 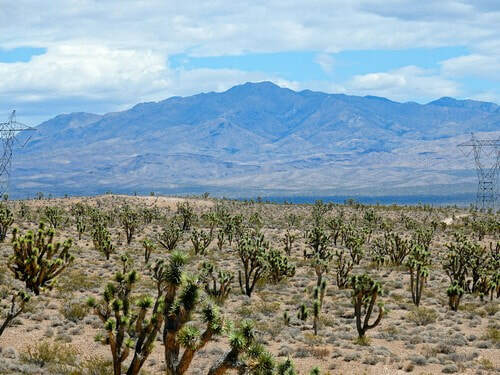 There are no specific points of interest on the road out, but stands of Joshua trees and views of distant mountain ranges are fantastic.